The Moldboard Plow (also called Bottom Plow) applies the principle of turning soil used widely in traditional farming. The plow turns over topsoil, bringing subsoil to the top and burying weeds and previous crops; thereby speeding decomposition. 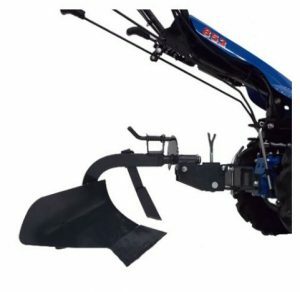 This is an alternative to the tiller and rotary plow attachments for first-time soil breaking. If used, a pass or two of the tiller will still be needed to prepare a ready-to-plant seedbed. 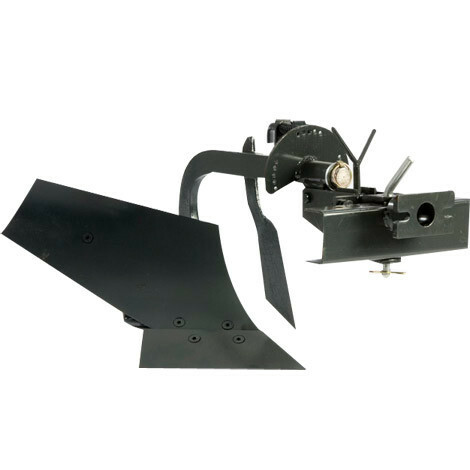 There is a special Moldboard Plow designed specifically for model 750 (p/n 9249992). The Swivel Moldboard Plow is comprised of two plowshares; one positioned over the other. One plowshare rolls the soil to the right, while the other rolls soil to the left. Pivoting the shares at the end of each row enables the operator to create and work in only one furrow. This is a necessity when plowing across slopes, since the soil needs to be turned uphill for good results. Because the plows require significant traction, the tractor needs large wheels and plenty of weight to be productive. Suited only for Professional Series models 749 and up, 150-pound Wheel Weights and12” wheels are required. 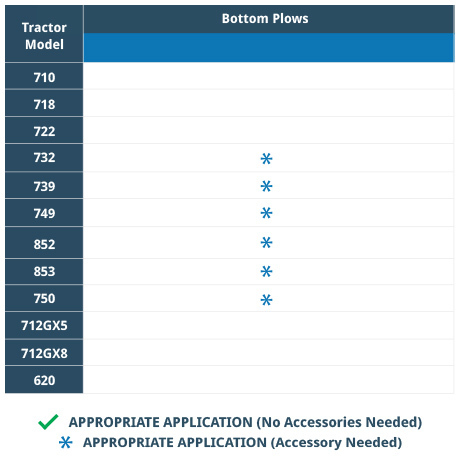 Unlike other non-powered implements, the Moldboard Plow does not need a Tool Carrier accessory, as the implement attaches directly to the hitch on the rear side of Professional Series tractors through an integrated carrier configuration. Required Accessories: 6.5” x 12” wheels and Wheel Weights. Turns topsoil to bury sod, weeds, and previous crops. Effective alternative to bust new ground when large wheels and wheel weights are installed. Swivel version available for plowing with just one furrow and for effectively plowing across slopes. Special, larger plow designed for model 750.